Congrats on your pregnancy. Now you have the opportunity to share the big news with those you love, especially your parents. There are a multitude of options for telling them. Now it's time for you to tell your parents. Want some interesting ones? Here are fun ways to try when announcing pregnancy to your parents that many moms have used in reality. Use a tongue-in-cheek style of trick to share the news with your parents by inviting them for dinner and showing them what is in the oven. Before they arrive, place one of your favorite buns into the oven then take them to the kitchen when they arrive. You and your partner can go with them and saying something like, what' that? That's what we are cooking. This can work for better results. Give gifts such as things that mention grandma, grandpa as presents during your special gatherings. Using baby bibs or clothing is a great way to surprise your family with the news. One of the fun ways to announce pregnancy to parents is to create your own fortune cookies. You can make them from scratch or use premade cookies and remove the fortune with tweezers. Then, add your own fortunes inside that say "You will spring into a new grandchild," or "With love comes happy baby." Get creative. Once you have the cookies, place them in a take-out box or a dish on the table. Put together a video of your baby's ultrasound and send it to your parents through email or text. Call them and tell them that you just sent them a song that you really think they will like. You two can just expect a fast response call later. If your family loves games, then use that to share your news. You can create your own cards for Mad Gab or Change the Community Chest Cards in Monopoly. Whichever game your family will enjoy playing, make it even more exciting by using it to announce your pregnancy. One of the best ways to announce your pregnancy in a fun way is to use what you know best. If you are a writer, then writing a poem is a great idea. You can then email it or mail it to your family and simply wait for the phone to ring. Another of the fun ways to announce pregnancy to parents is to send them diaper cards. Cut a diaper shape out of white paper, with tabs and all. Then, place a picture of your ultrasound on the inside with a note that says congratulations. Simply mail them out and wait for the response. Are you taking a family vacation? You can volunteer to provide the shirts or simply deliver them as gifts. Each shirt can be specific to each family member and say things such as "Favorite Grandma" or "Favorite Aunt." Make sure to put your camera out when they are opening their gifts. If you don't have kids yet, you can make it a surprise by giving your husband a shirt that says Best Dad Ever. Add a high chair to the table when you gather for a family dinner or a holiday gathering. For example, a Thanksgiving Day, you can give thanks for your new addition. Create a mixed CD of your parents' favorite songs with you and your husband making the baby announcement at the end. They will have this forever. Purchase a baby outfit. Tell you mom you got a new outfit and you want to know what she thinks about it. Hand her the bag and have her look. Record this process as a video is a good choice. Is it family picture time? 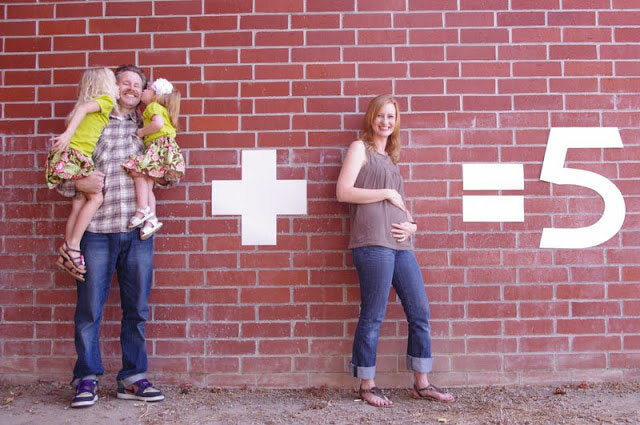 Take several pictures of them making funny faces or standing in funny poses, then for the last picture announce that you are pregnant and capture the moment. When you are out with your mom, park in the "expectant mothers" space. When she tells you that you cannot park there, tell her why you can. Then just expect your mom's reactions. Nobody can turn down a piece of chocolate. Take a picture of you and your husband with the positive pregnancy test, sonogram, or baby clothing and place it on the piece of chocolate. Be sure to offer those pieces to your family.